The design of the three cent nickel is simple but elegant, a testament to James Barton Longacre’s talent and long experience as an engraver and illustrator. The main element on the obverse is Lady Liberty, who represents the United States. She is rendered in the style of ancient Greek and Roman statues — a style that was very popular on U.S. coins in the 1800’s. Lady Liberty is in profile, facing left and wearing a beaded coronet (a small crown) inscribed with the word “LIBERTY.” Longacre was well-known for his skill in engraving hair and wreaths, and his Lady Liberty has long, beautifully flowing hair. The three cent nickel was designed by James Barton Longacre, the Chief Engraver at the United States Mint. 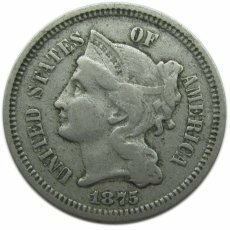 It was introduced in 1865 to supplement the three cent silver (an existing three-cent coin that was being kept out of circulation by post-Civil War hoarders). It was also intended to replace the very unpopular three cent paper notes (“fractional currency,” also derisively nicknamed “shinplasters”). Longacre’s problems increased in 1849 when the Mint was authorized to create designs for two new gold coins, a dollar and a double eagle (a twenty-dollar coin). 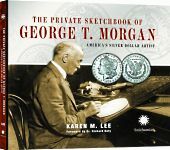 Peale was making heavy use of the Mint’s Contamin portrait lathe as part of his private medal business, but Longacre needed to use that piece of equipment to create the dies for the new coins. Peale became very resentful and began claiming that Longacre’s work at the Mint was substandard. Patterson denied Longacre’s request to hire temporary help for the coin design job, but he did offer to contract out all the Mint’s engraving jobs to an outside firm (thereby bypassing Longacre and eliminating his job as Chief Engraver). Longacre refused this “offer” and worked very long hours to do all the engraving work himself. 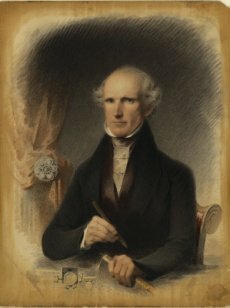 In 1834 Longacre partnered with another artist, James Herring, to create a new work, The National Portrait Gallery of Distinguished Americans, which was published in four volumes from 1834 to 1839. To create his engravings, Longacre met with and sketched many important political leaders, including President Andrew Jackson and Senator John C. Calhoun (who had been Jackson’s first Vice President). 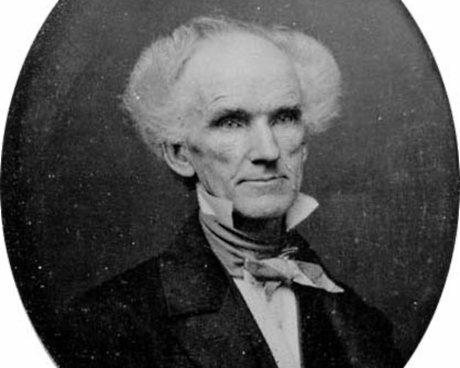 Calhoun was especially impressed with Longacre and later became a strong advocate for him in the Senate during Longacre’s years at the U.S. Mint.